Identify low bone density before it results in injury. 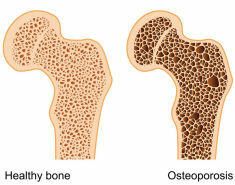 Osteoporosis is a medical condition where the bones become fragile and brittle due to reduced bone density (or mass). The loss of density is attributed to a decreasing or insufficient amount of minerals in the bone. Bones (like tissue and muscle) need minerals to maintain good health and strength. The minerals most commonly found to be lacking include calcium and vitamin D; however, there can be other reasons for a loss of bone density. One way to determine low bone density is through bone mineral densitometry, also known as a bone density scan. Your bone health is important, so talk to your GP about your risks and any concerns you have. Bulk billed bone density scans are available for “at risk” patients. You had a hysterectomy before 45 years of age. You suffer from chronic liver or kidney disease. ​For more information speak to your nearest Family Practice Medical Centre about their bone scan clinic and how you can participate. For practice contact details follow the links in the scan clinic availability list. Every 3.6 minutes someone is admitted to an Australian hospital with a fracture.